Gordon Strachan says having his first match as Scotland manager at Aberdeen's Pittodrie Stadium will make the occasion "even more special". 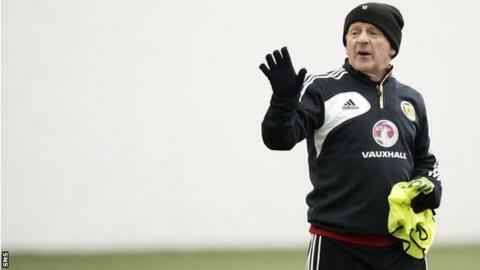 The 55-year-old, who has replaced Craig Levein, will oversee his maiden international against Estonia on Wednesday evening. As a player, Strachan enjoyed success with the Dons in the 1970s and 80s. "The good wishes I have received, especially here in Aberdeen, have been overwhelming," said Strachan. "When I first got the job I thought 'wherever the first game is, it will be fantastic' but I think I've realised it's even more special that I'm going back to Aberdeen where I enjoyed smashing times with great players. "I'm going back again 30-odd years later and the best wishes have been overwhelming, especially in Aberdeen. The people that I've met around this area recently have made it even more special. "The group Craig [Levein] passed to me are a smashing bunch of players and sometimes they're over enthusiastic but we can always curtail that." revealed he would co-operate with club managers who wished to minimise player fatigue. "I spoke to a lot of managers recently and I'm trying to do the best for the group and the best for the managers," added Strachan. "The team that is picked is the best one we can put out. "We're taking into consideration the last time they played, the conditions they played in and who'll be playing at the weekend. "We'll try to help them and try to get something positive for ourselves."